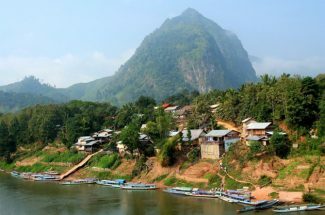 Laos is not only known as the country owns the wonderful landscapes but also known as a country with rich in culture and tradition. 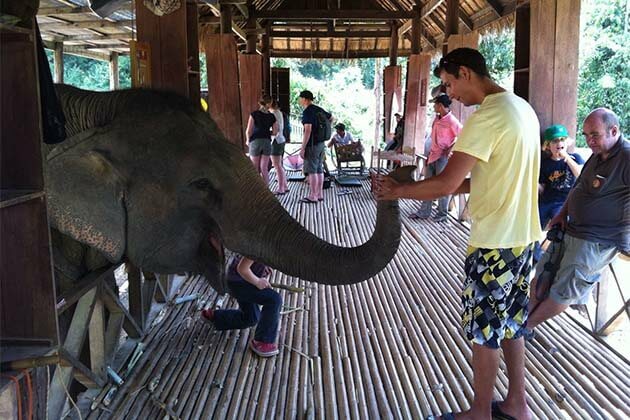 If your Laos tours are planned on these holidays, congratulation! 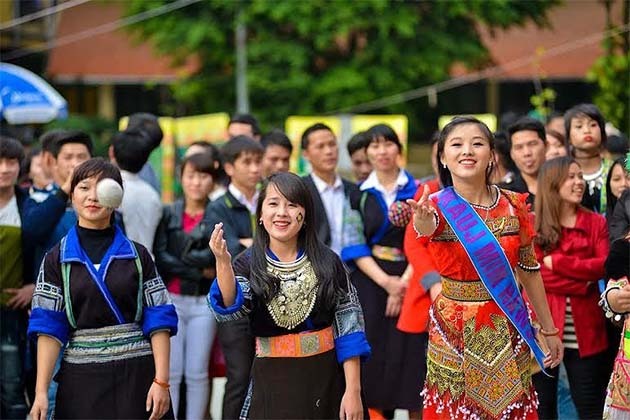 Don’t miss the opportunity to participate in Laotian festivals, and take a ton of pictures. 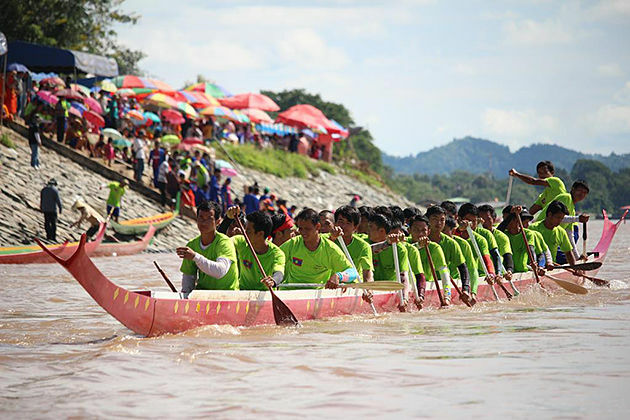 Boat racing festival is a term used in a special festival in Laos. 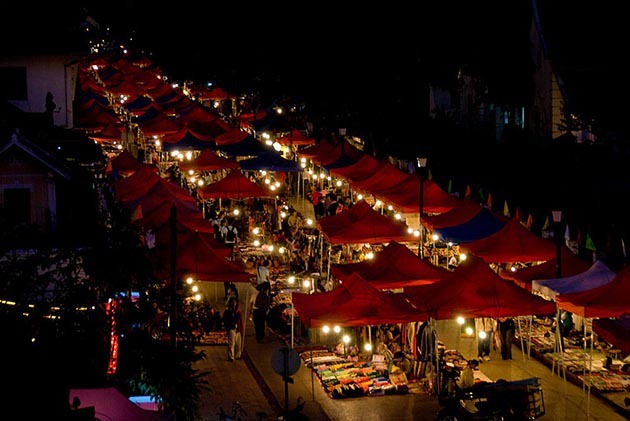 This one is one of the official festivals which is only held in Vientiane capital. The boat racing festival is common throughout Buddhist, during a full three – month period generally running from late August to the end of October. Actually, it varies in each year, but most races are held on the weekend, start at noon and end by sunset. 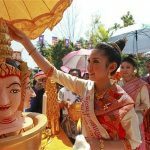 About midway through Buddhist Lent, the first major boat racing festival is held in Luang Prabang as well as on along the Mekong River. Finally, Ban Xieng Ngeun is the last point. The time for Boat Racing Festival is also time for other festivals. Before the race, the bamboo rockets will be shot off to announce. At the same time, there are many local markets grow up, and many other entertainments combine with. Usually, the water is higher than normal in the rain season, and this is the good time for boating, and the farmers don’t have to concentrate on the work, and it also the low point of the tourist season. 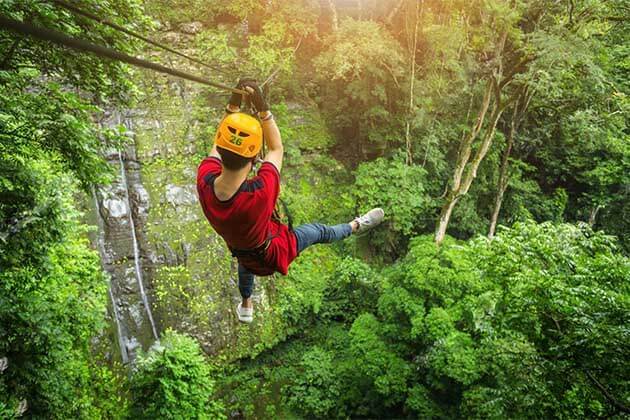 In fact, this event always creates a lot of excitement with many locals as well as the tourists. 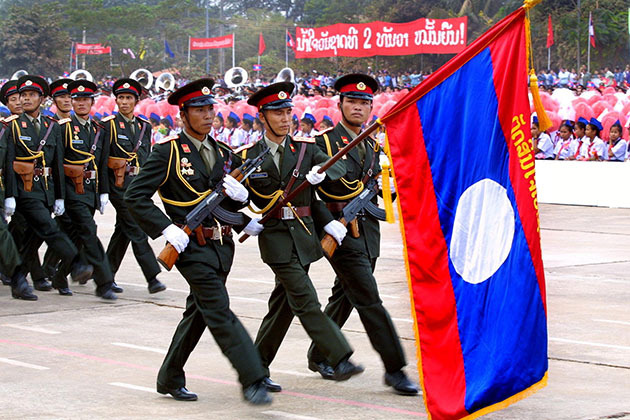 Laos’s National Day celebrated annually on December 2nd. In 1975, It becomes a public holiday which commemorates the creation of the Lao People’s Democratic Republic. It’s time for the citizens to have the opportunity to celebrate their country’s history and their present independence through festivities. In the beginning, The Lao government official starts with speeches, and the parades will take place. On this day, Laotians often hang the flag which has the symbol with hammer and sickle and the symbol for the National Day. There is three main color in the Lao Flag. The red is meant to symbolize blood that has been shed for the country’s independence. The blue meant the country health, and the white disc-shaped emblem on the country’s modern flag represents the moon over the “Mekong”. In Laos, the Laos National Day is held in the three big cities: Vientiane, Paske, Savannakhet. 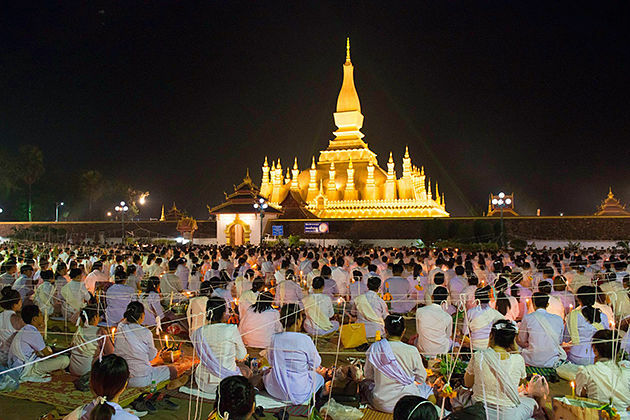 That Luang is one of the most important of national public holidays in Laos. It’s regarded as a Buddhist celebration centered on the That Luang. Only in three consecutive days, the That Luang Festival is held, beginning on the full moon of the twelfth month of the Buddhist Calendar. Sometimes, it’s will be held in November on the Gregorian Calander. The That Luang stupa was from the Hindu temple which was built in the first century A.D and officially became a Buddhist temple by Third Century A.D. Throughout its long history, it had to be rebuilt in many times and the modern building was built in 1566. Located in the center of Vientiane, it makes impressed by covering in gold which makes the temple is more attractive. Moreover, This temple becomes more sacred than ever because it contains some relics of Buddha. During the That Luang Festival, Buddha monks will be gathered at the stupa for religious ceremonies. They performed Buddhist rituals: make offerings, offer incense, circle the stupa thrice, and do other religious rituals meant to earn merit. At the festival, visitors can enjoy the musical and dramatic presentations which are participated by both people and monks. 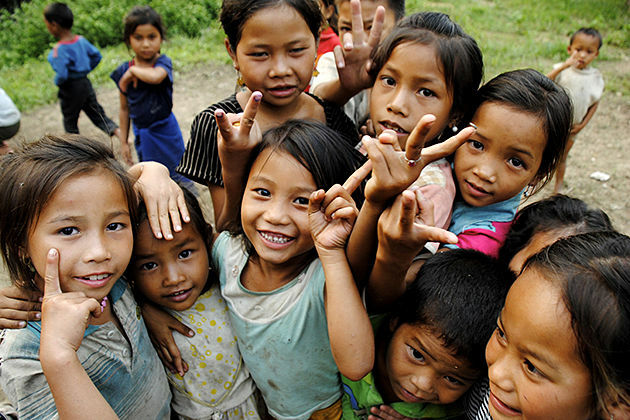 Each 1 June is also the Children’s Day in Laos. the government admits that the children of today represent the future of the country and therefore recognizes and promotes Children’s Day each year. On these days, many organizations also contribute to Children’s Day. The children are taking part in many programs, dancing and singing, and wear traditional Lao skirts and clothes, and also participate in cultural and educational activities. The Children’s Day is also a time to awareness campaigns and protects the children which aim to help kids to get a good education. On the last day of the Children’s day, besides the children’s parades, the Kids will be also given a small gift. and their family may even take their children out on a special day trip. 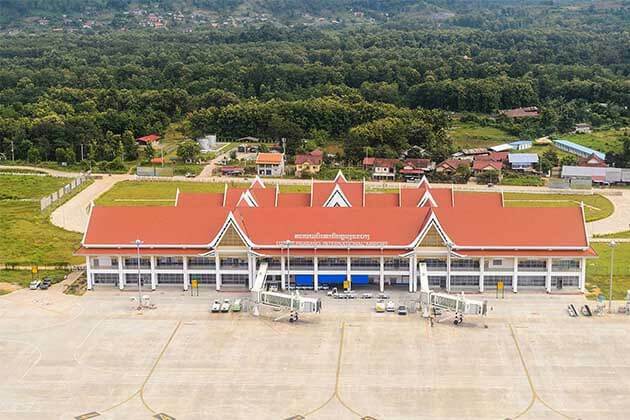 Like other countries in the world, 1 May is celebrated as Labour Day in Laos, a public holiday is recognized the vital contribution of workers to the country and to fighting for the worker’s rights. 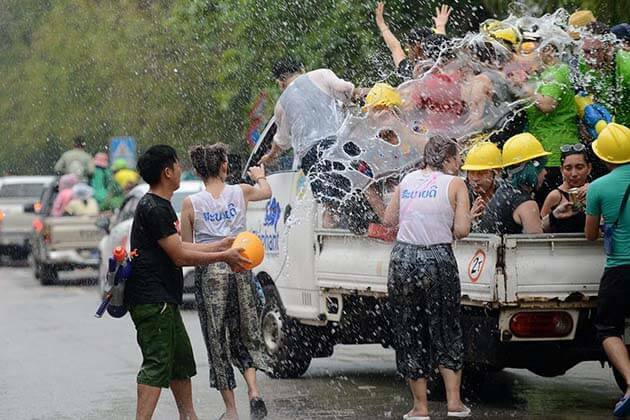 In Laos, there is a federation of trade unions organizes activities for Labour Day in the capital city of Vientiane as well as other countries. The lectures, the rallies, and “community walks” that promote and celebrate the role of workers and the rights of the workers in Laos.